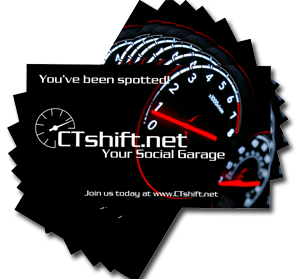 It's one of the most compact business marketing tools in use today. It sits quietly in card files, card cases, and desk drawers everywhere, but very few people know how the contemporary business card came to be. Evolving from several different forerunners that eventually blended into today's familiar format, the business card has a captivating history. Bearer cards, calling (or "visiting" cards), and trade cards were the three main predecessors that turned into our modern system of exchanging business introductions. 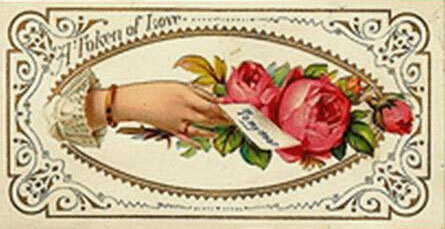 These cards were early forms of advertising as well as symbols of personal and business status. Even today, business cards continue to be one of the most effective means of advertising products and communication. Bearer cards first appeared in England and France in the late sixteenth century. They were often made of playing cards written on and signed by gentlemen. Bearer cards were actually legal documents used to communicate obligation, such as conveying debt, promissory notes, or other messages of intent. Before the telephone and the Internet, in-person visits ("calling") were the primary means of social interaction. China and France both claim to have been the first to use visiting cards during social visits. 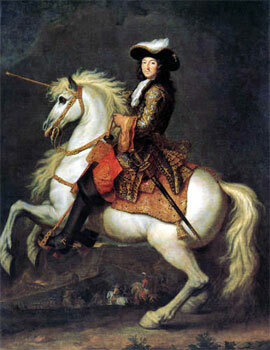 In fifteenth century China and seventeenth century France, aristocrats and royalty began to use them. 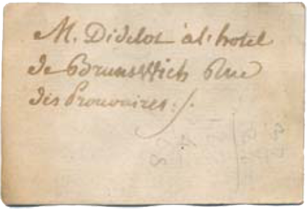 Servants would deliver cards to the servants of prospective hosts, announcing their employers' arrivals. During the reign of Louis XIV in France, handing out cards as a means of introduction became a fashionable trend as well as a polite way to request meetings with potential hosts. This practice applied to ladies as well as gentlemen, and the calling card was born. Formal French court etiquette evolved around calling cards, and in England as well as France, complex, rigid, sophisticated rules for using them were put into place. 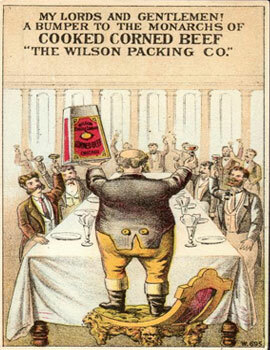 By the mid 1800s, calling cards and their proper etiquette had arrived in America. The upper classes in the rest of Europe and North America also implemented these rules. Generally, working class people and country dwellers did not use calling cards. Cards were a simple means for servants to introduce someone's arrival, though complex rules developed around their use. Etiquette dictated, for instance, that married women leave their own cards as well as their husbands' even when the men did not attend social functions. Folding the cards in certain ways, such as in a particular corner or down the middle, conveyed different messages. Often, people would write abbreviations for French expressions of congratulations, Happy New Year, and other sentiments. To provide evidence of meeting social obligations, visitors would leave their cards in card trays in halls or parlors of their hosts. Smaller than today's business cards, Europe's and America's nineteenth century calling cards usually had one's name engraved and were printed on glossy stock. Designs became more elaborate later on, including coats of arms and motifs such as hearts, doves, scrolls, and forget-me-nots. Hosts kept them as records of their visitors and knew whose calls to reciprocate. The more elegant and ornamental the cards, the more noticeable they were. These attractive cards would often be pasted into family scrapbooks. This practice set the foundation for future traditions of exchanging Christmas and Valentine's Day cards. In England, calling cards morphed into trade cards. These were used for business rather than social practice and in fact, trade and visiting cards had totally separate purposes. Before street numbering in eighteenth-century London, trade cards served as maps directing customers to store locations, as well as advertisements and a means to exchange contact information. Trade cards often bore a merchant's name and address, and before street numbering, a description of where to find the store. They also served as invoices, receipts, and places to jot down quotations, price lists, and other handwritten information. Early European trade cards were reproductions of store signs. Once numbered addresses were available, the cards became more pictorial, with better illustrations and rich descriptions of merchandise. At the time, newspapers were just developing, and were not yet seen as vehicles for business promotion. All social classes that had a business to promote used trade cards--they were not restricted to use by the upper class. Early commercial printing mostly used monotone copper plate engravings. With the advent of chromolithography, trade cards began appearing in color. 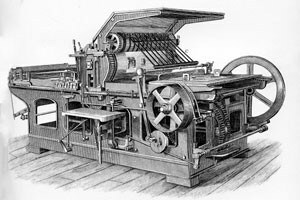 Unlike newspapers, which were printed on large presses, trade cards were often printed on small printing presses known as hand or card presses. They made the cards less expensive to print and faster to produce. Small businesses as well as larger successful companies could now afford to advertise. Sometimes, trade card designs were done in ornamental lettering without pictures. Type foundries in the 1860s made specimen books available to the public. Business owners could then choose from a wide variety of typefaces. If there were engravings, the engraver's name or initials would appear in the lower right hand corner of the card. Multiple color lithography became the main form of printing trade cards around 1830. However, it did not become popular in the US until after the Civil War. The 1876 Philadelphia Centennial Exhibition was a springboard for the nearly overnight popularity of multicolor trade cards. Over the next ten years, they appeared in stores everywhere, advertising nearly every type of product imaginable. Color lithography also helped trade cards become true works of art. Ornate designs were printed on seven-by-four inch paper, and were handed out liberally to the public. Because color images were so rare at the time, these novel, eye-catching cards were special to Victorians. People of all ages collected trade cards and pasted them into scrapbooks. They served as reminder advertisements, and their shelf lives were much extended with this national craze. Business owners took advantage of trade card popularity and made their cards as attractive and unique as possible, increasing the probability that their cards would be kept in scrapbooks. Printers also offered stock cards preprinted with basic designs, to which a merchant could add his own customized information. Visiting cards were used socially, and trade cards had developed into vehicles for mass advertising. Sales reps, bill collectors, and other entrepreneurs still needed a way to introduce themselves, exchange contact information, and leave messages that they called in person. 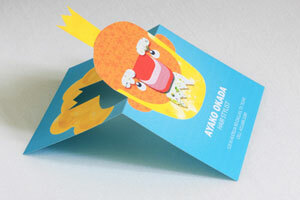 As trade cards transformed into colorful, illustrated works of art, the need for modern business card templates arose. Smaller, text-based cards, printed on card stock, began to appear. Business cards were once again a simple way to exchange contact information and introduce oneself. By the twentieth century, print advertising began to replace trade cards and the public regarded print ads as more relevant than trade cards. Children considered trade cards too old-fashioned to collect anymore, and the number of trade cards printed declined. By the 1920s, they had all but disappeared. Magazine and newspaper advertising took their place, as did the modern business card. Today, people carry personal business cards as well as business cards. Personal cards are printed with home addresses and telephone numbers, and bear no affiliation to one's employer. Many businesspeople also have more than one business card design. They may print different information on them for various market segments. Depending on the contact they want to have with a prospect, they might exchange private phone numbers, exclusive web addresses, or general street addresses and job titles on business cards. Business cards were printed with black ink on white card stock for many years. Colorful cards are more popular now, and technology has brought their novelty back, keeping them fresh and noticeable in a world that is overcrowded with advertising messages. There are now business cards on CD; plastic, wood and metal business cards; folded business cards; and cards with photos on them. There are even Vcards, which are digital business cards, so people can save the work of copying contact information into their computers. They simply import the Vcards into their contact management software and the information is saved. With continuous innovation and advanced printing technologies, it is easy to distinguish oneself from others. The price of printing full-color cards continues to drop while the range of layout templates and stock designs makes it easy for anybody to design and order their own cards right on the Web. While some people might think that business cards are old-fashioned or no longer serve a purpose, they continue to be one of the most cost effective ways to market a business.